Witnessing a family member suffering gut-wrenching pain due to sickness can be heartbreaking. 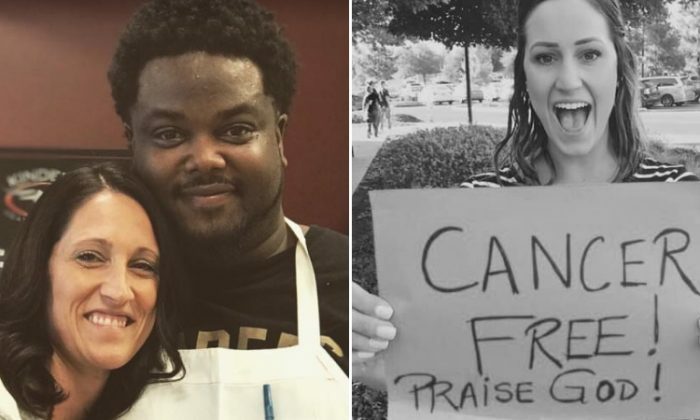 A woman whose sister was battling cancer found peace when an “angel,” as she calls him, appeared to give succor and strength. One Friday in October 2018, Joslyn Fenyes accompanied her cancer-stricken sister Erica Turner to the hospital, where she underwent chemo treatment. Chemotherapy can cause fatigue, so understandably, Turner was exhausted after the treatment. When the pair dropped by Kinder’s to have a quick bite of lunch following the hospital visit, the tired Turner sat outside, dazed and sleepy. As Turner rested outside, Fenyes went inside the restaurant to order their meals. At the counter, she struck up a conversation with the gentleman who helped take their order. Fenyes revealed to him that her sister had just undergone chemo treatment. Upon hearing that, the gentleman said, “God bless her.” After saying, “Thank you,” she collected their food and went outside. Minutes later, Fenyes chanced upon the same gentleman again when she headed inside the restaurant to get take-away boxes for their food. This time round, he told her something that touched her deeply. “He stopped me, looked me in my eyes and said ‘mam, please tell your sister that I just stopped and prayed for her and God has her. She’s going to be ok!’” Fenyes recounted on Facebook. Shortly after the heartwarming encounter, Fenyes’s prayers, together with that kind gentleman’s prayers, were answered—Turner was declared cancer-free! Receiving the good news, Fenyes stopped by Kinder’s four times that day, hoping to find that employee, who had offered her family peace during their difficult time. Finally, she met him and learned that his name is Byron. “I just had to go back in to thank him and share with him that God answered our prayers … his prayer! He grabbed my hands and cried with me. Right there in the middle of his place of work. He hugged me tight after we officially introduced ourselves,” she continued. It’s a special moment Fenyes will hold near and dear to her heart for her entire life. The kind Byron has shown Fenyes that there are still good people in this world. “Love always wins. Always,” she concluded. Fenyes’s post, re-shared on Facebook page “Spotlight,” garnered a ton of comments. “Byron sounds like one of those ‘earth angels’ whose halo and wings are invisible until it’s time to reveal them. You were lucky enough to be chosen for that reveal. God works His wonders through some of the simplest things,” one user wrote. Kindness like this surely goes a long way. In another instance, a cancer-stricken mother was eating at a restaurant, and just then she received a touching note that melted the hearts of both herself and her family. Meanwhile, the waitress passed on a note written on the check to her from another customer. Moved by the kindness of the stranger, Edwards took a photo of the note and posted it on her Facebook page, and since then her post soon gained traction. Indeed, sometimes when life gets difficult, look closely around you. God’s angels will appear in many different forms to give you comfort and to help you believe in miracles again.